Today was our last day on the site so we finished up profile drawings and back filled. There was a lot left to do so it was a busy day filled with screening and packing up the site. Also some last minute mapping was done and pictures were taken. Light Horse finishing his unit in the barracks! Mapping the bakery on the last day! Jean diligently mapping out units. Back filling is rather simple you just put down your tarp as close to the edges in your unit as you can and then fill it with sand. You just have to be careful to leave enough slack so the sand does not pull the tarp all the way down and then spill into the unit. It’s important to back fill because if you want to come back to that unit at some point in the future it is well preserved. The past four weeks have been an amazing experience with people I will never forget. Thank you to anyone who took the time to read our blog posts, we all appreciate your support! The sun is setting on our time at Fort Tombecbe and while I miss my family, I am also sad to be leaving. It has been a most excellent four weeks of hard work, exciting discoveries, and moments of hysterical laughter for no reason whatsoever. For the next few days we are all busy wrapping up various tasks and closing our site. Today I finished all the paperwork for the unit I’ve been working on in the bakery area and tomorrow morning I will finish up with a light cleaning so we can take a final picture. 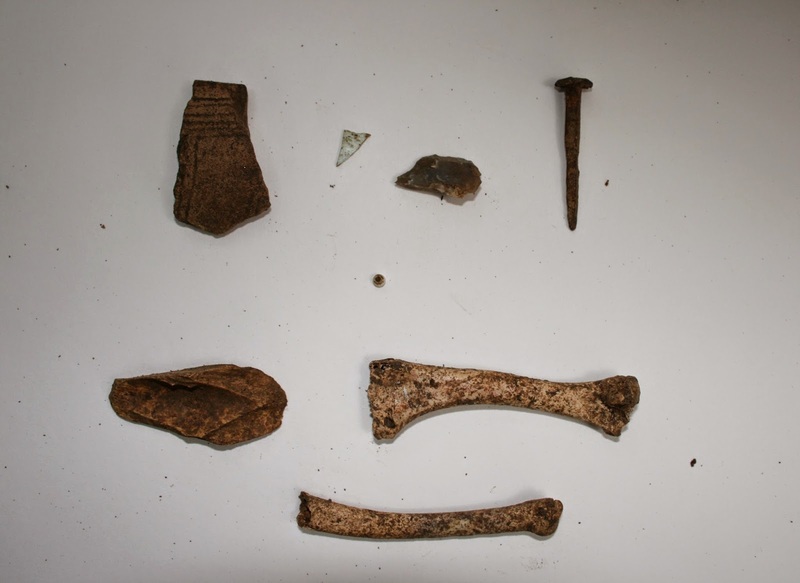 It has been a productive field school and there are finally enough artifacts to begin to reconstruct some aspects of daily life at Fort Tombecbe. 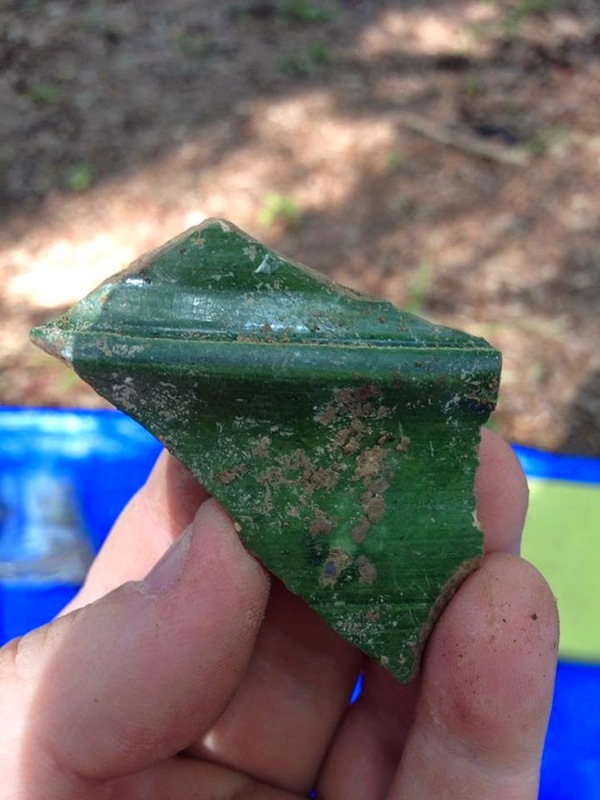 Analyzing artifacts is a large part of the archaeological and historical process of developing a cultural narrative of Fort Tombecbe. I decided earlier today that for this post I wanted to attempt to create a snapshot of how a man garrisoned at Fort Tombecbe might spend part of his day. Before I start, I would like to thank Brian Mast for patiently providing me information about French marines and his understanding of fort life. Day begins at sunrise. Various noises would have filled the grounds: animals, the sounds of cooking, popping fires, and men mustering for roll call. After a headcount the men would have gone on to their various duties. This could include anything from guard duty on the palisade wall to hunting and foraging. At some point in the day the Choctaw probably came to trade and most likely share and gather news. Beads, Colonoware (a type of earthenware pottery made by Native Americans to replicate European products), and a stone tool discovered under the barracks illustrate the types of goods that flowed between the French and Indians. 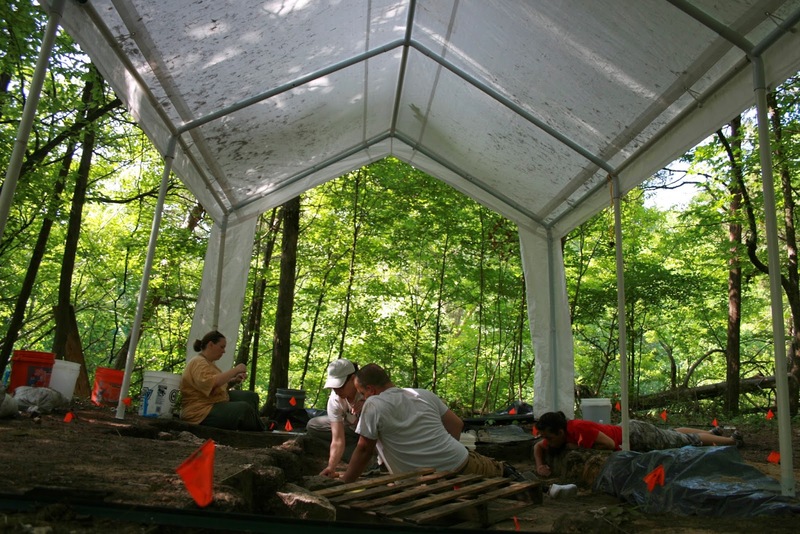 Based on items discovered during the 2014 field school reconstructing free time is a bit more accessible. In the bakery area both BJ and I found sprue inside ash deposits. 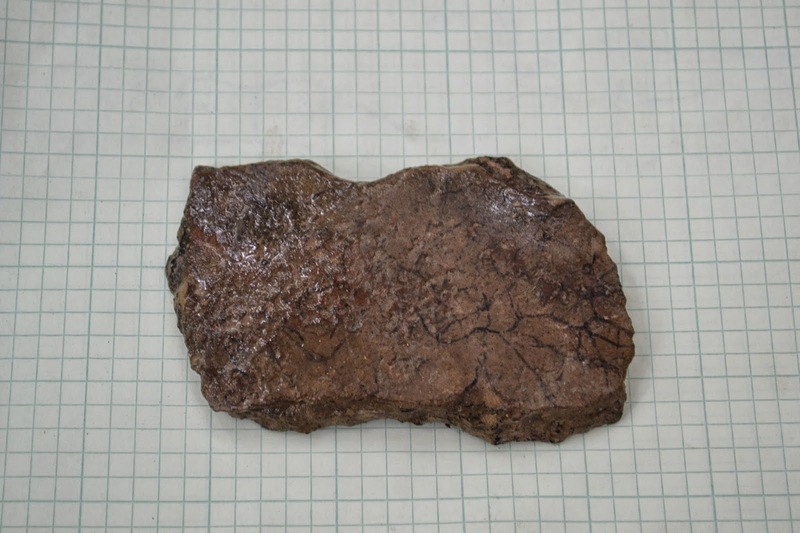 According to Brian and Dr. Dumas, this is the byproduct of making shot (a heavy ball of lead ammunition). None of the traditional sources concerning the fort discuss this project, yet within a trowel of soil the story unfolds a bit and it is possible to imagine a man far from home sitting around, possibly in a small group, shooting the breeze while making shot. What is puzzling to me is that we found these objects inside the bakery. Our best hypothesis at this point is that the bakery had a hearth and fire which is necessary to melting lead (and probably smelled much better than many other parts of the compound). Bread constituted a staple part of a French soldier’s rations. 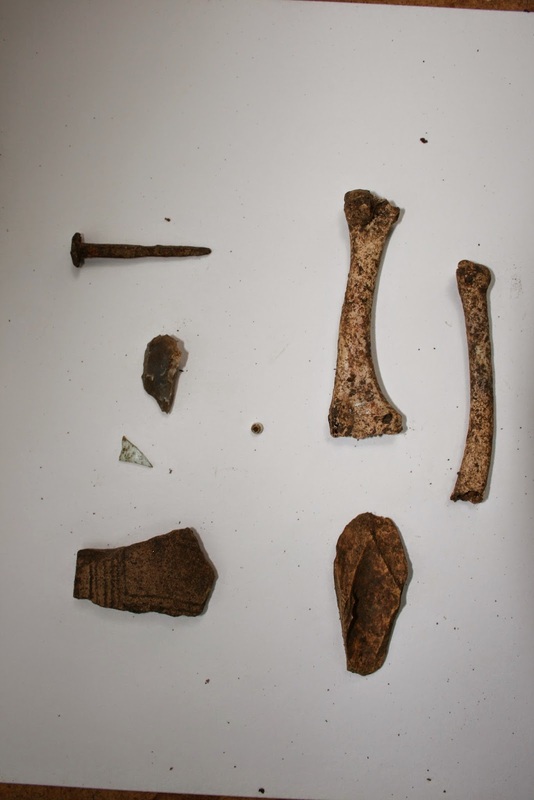 Soldiers also hunted and foraged the local area and a variety of bones found under the barracks and inside the bakery indicate that the men fortified their diet with fowl and venison. 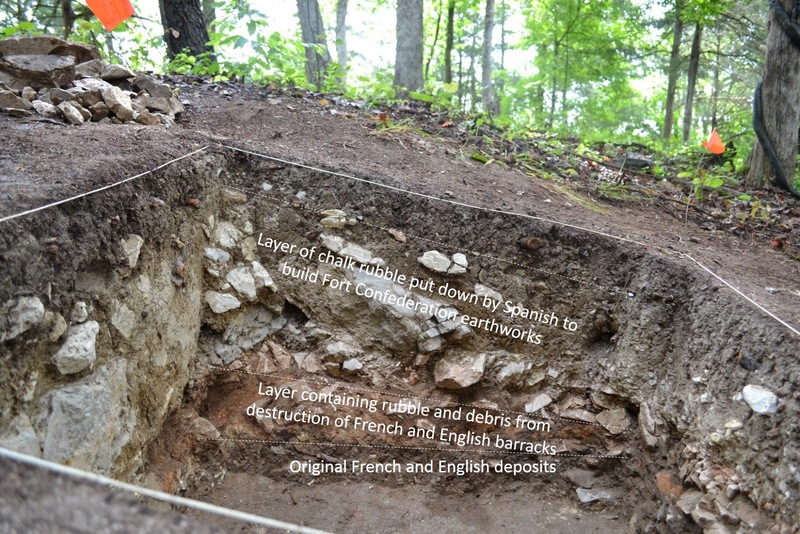 Large sherds of Indian pottery as well as green lead glazed earthenware indicate that the French soldiers cooked and ate in the barracks. 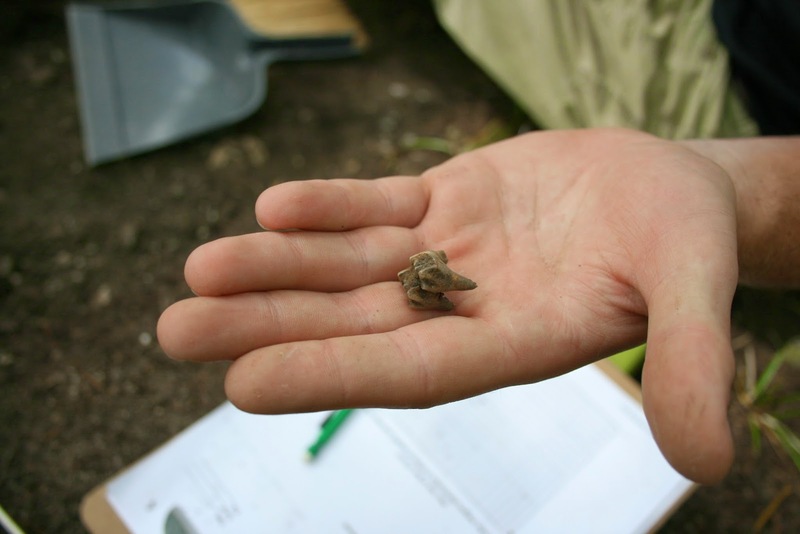 Traditional histories present the barracks area as a sleeping space, but the presence of pottery, and animal bones complicates this narrative and provides a richer understanding of fort culture. 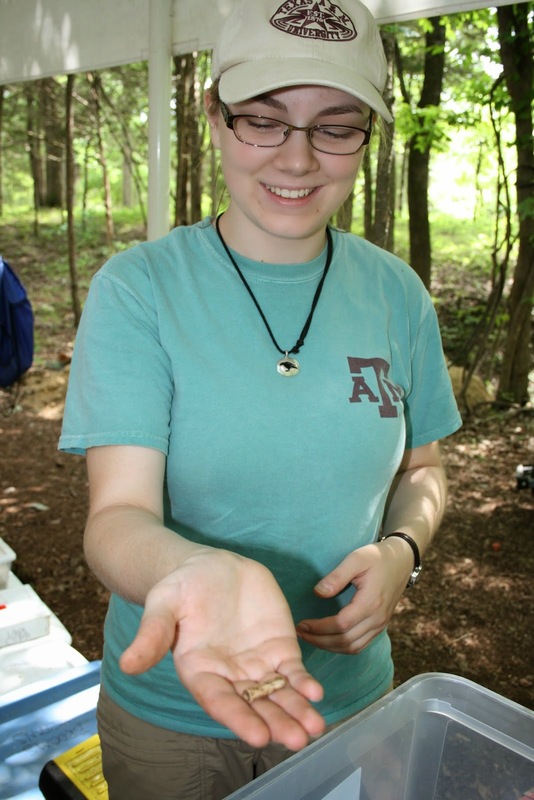 By far the most exciting discoveries this summer involve textiles. Lighthorse Lee found a rather significant scrap of fabric in his unit in the barracks area. Coupled with the colonial pin discovered by Natalie in the bakery area indicate that to some extent the soldiers at the fort mended and patched their clothing and bags. Textiles are very rare and finding a pin is a bit like, well, finding a needle in a haystack. Though the objects are from different areas of the fort, they once again provide a window of understanding in how free time was passed at Tombecbe. I hope that this very basic sketch of Eighteenth century life at Fort Tombecbe helps all of our faithful readers understand what we have been up to this summer. As for the Twenty-first century field school students we pass our free time launching water balloons and chilling around the UWA campus. This is the last time that I will be writing as unfortunately Fort Tombecbe Field School is coming to a close. Today we arrived after a stormy night that appeared to have cleared up. We bailed the water and removed the protective tarps and begun excavating or screening our dirt. Soon (around 2 and a half hours after arrival) another Storm Cloud of Doom rolled in and we rushed to cover our units. I have never seen us pack up so quickly these last few weeks! When we returned to the base of operations (Livingston), we took a fifteen minute break and then headed to the laboratory. 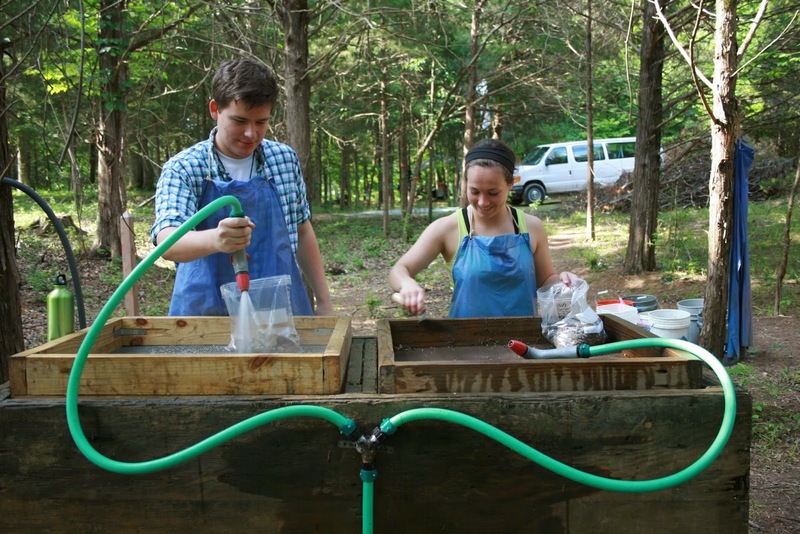 Instead of washing artifacts, we were introduced to a new procedure. Sorting! It is pretty much what it sounds like, you organize the material into different groups. This is only done after the material has been washed. The organizations can be separated by numerous methods, but the method we chose was distinguished by what the artifacts were made by. There were several different distinctions such as Kaolin (the material used to make clay pipes), brick, charcoal, coal, beads, glass, unidentified metal, silver, etc. You separate these artifacts from the matrix. The matrix is all the other stuff. I know that's not very descriptive, but it is highly varied because the matrix is technically everything that is not culturally significant. This includes all the chalk, pebbles, fossils, and mineral inclusions. After it's all separated then you place each collection of artifacts into distinct bags. On each bag it has the information of the area it was found and what it is. Then all of the bags you have just collected will go in a singular bag with the overall information. It's a lot of repetition, but this way you won't lose any information which is so precious to the archaeological process. If you feel like you're doing the same thing over and over that's a good sign! Week 4 Day 1: Death by Cows, Pipe Stems and Musket Balls! Our day started off calmly. Each of us is focused on completing the units that we've started as we enter our last week. As for me, today was extremely surprising (in many ways)! As I finished up Layer A of my unit (about 25-30 centimeters below ground surface), I came across a wonderful artifact: a pipe stem! 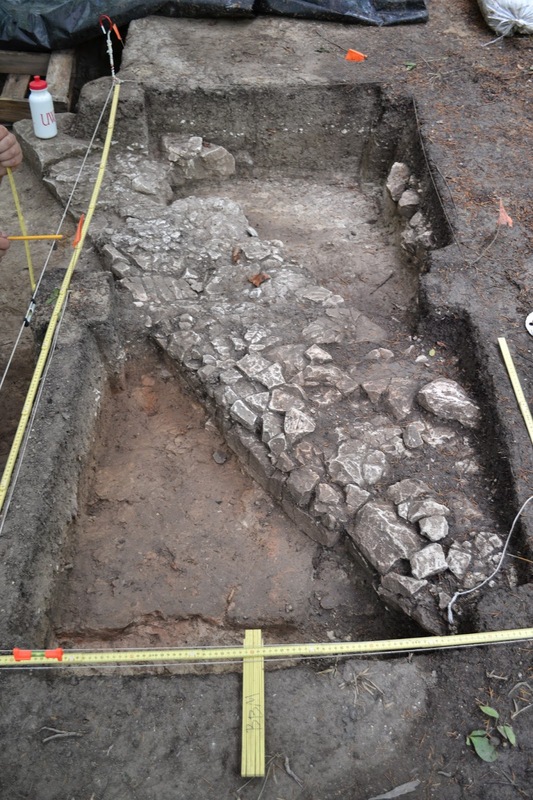 Pipe stems are very important in historical archaeology sites because they can be dated fairly accurately. The pipe stem bore (or hole) is measured to pinpoint the pipe to a certain date range. Overtime, the size of the bore decreased. 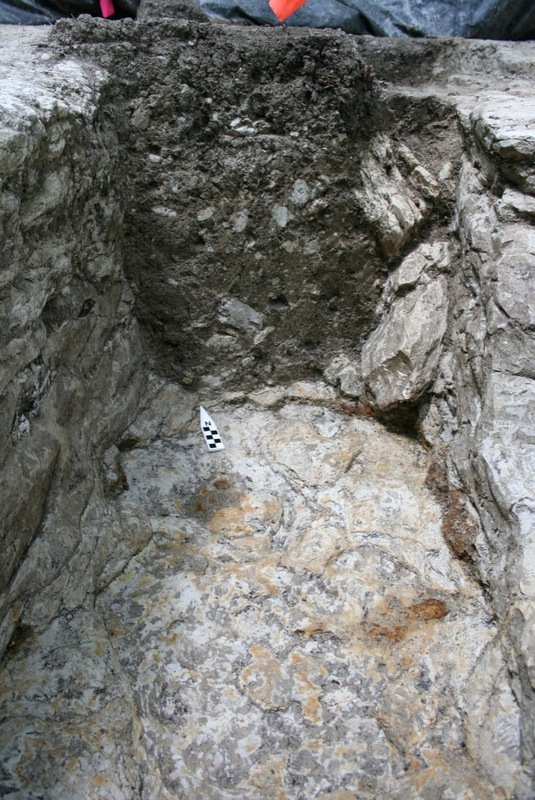 The pipe stem that I found had fairly large bore, indicating an early date. After I finished Layer A, I started on Layer B, which is composed more of clay and chalk. 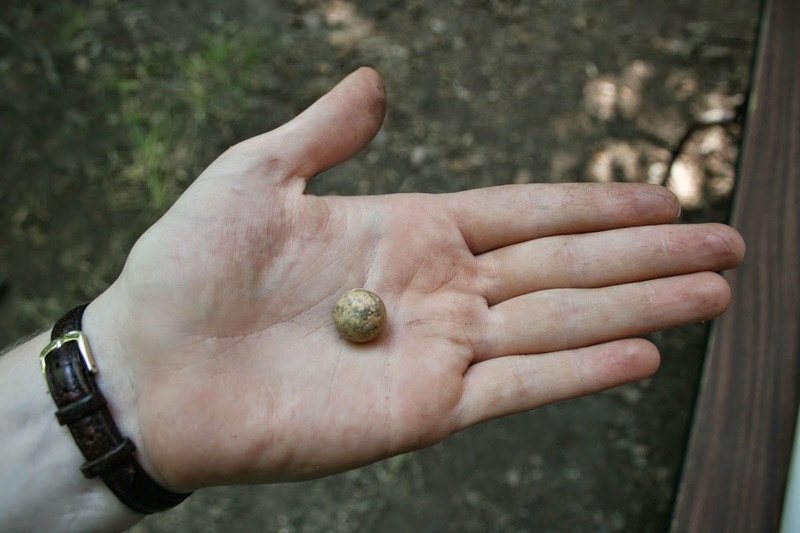 Right before we packed up for the afternoon, I found a musket ball! It was extremely exciting!! As we left the site, a few of the cows escaped the pasture where they were penned. We tried to round them up, and successfully got the female back in the pasture. However, the male, a bit too attached to my voice, decided to charge. I won’t go into details about what went through my head at that moment. But that cow definitely got within a foot of me before cantering off. I just thank my lucky stars that I’m here to write about it! - - Elle, signing off for the last time! It’s been a blast!! Today was open house and we had some honored guests and a few parents come out to the site for a tour and a glimpse into the inner-workings of archaeology. It was a little foreign for us to give up our air conditioner and late alarm clocks on a particularly hot Saturday, but I think everyone managed to keep it together and impress everyone who visited with our findings; and if not, Brian definitely entertained everyone with his British musket, which I must say was the highlight of the week. Dr. D looking like a pro. Other than that, we believe that Jean has found a rather spectacular hearth. We're speculating (only because we cant prove it with absolute certainty) that it is the original French Bake House hearth. 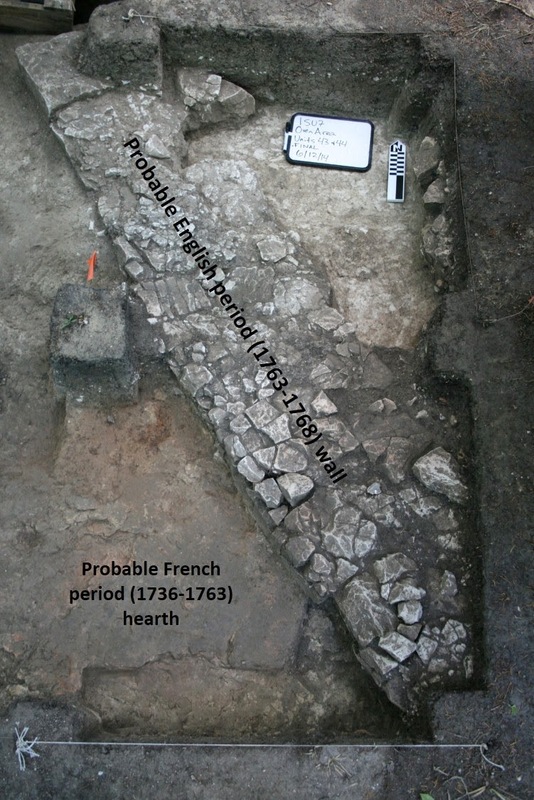 The chalk block wall/foundation that we've found runs over it, meaning that the hearth is the original first hearth and the chalk foundation that we've found is most likely the British reconstruction of the building. That also makes sense when taking into account the lay of ash in the unit adjacent to hers. That unit happens to be mine and I find it ironic that in the first week I was digging through 20th century charcoal and fire debris, and now i'm digging through a layer of (suspected) 18th century ash, charcoal, and fire debris. Apparently, this particular spot attracts fire. Sadly, this happens to be our last weekend together as a group. We finish up our work on Friday and depart for our post-field school lives. I don't think anyone came to small-town Alabama expecting or even intending to forge life-long friendships in just a few short weeks, but that is exactly what has happened. It has been a privilege and an honor. p.s. shout out to everyone who came to visit the site; it was nice meeting new faces and seeing familiar ones. p.p.s. Happy Birthday to Littlefoot's Mom.